Get ready, as Lancaster Sheriff's Station invites you to a weekend of fun & support for the Special Olympics! 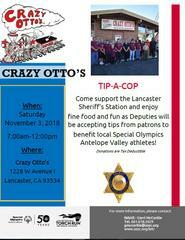 Lancaster Sheriff's Station invites you to a fun weekend in support of the Special Olympics! First, on Friday, November 2nd, 2018 from 6am-10am, our very first Cop on a Roof Top! It's a bird, it's a plane! Nope! 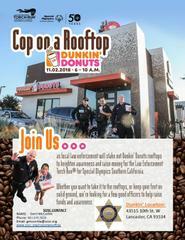 It just our deputies up high on the roof top of Dunkin Donuts at the corner of 10th Street West and Avenue K in the City of Lancaster. Bring your kids out for an early, before school treat, and give us an extra donation in support of the Special Olympics! The next day, on Saturday, November 3rd, 2018 from 6am-12pm, join us for Tip a Cop! Bring the family out to Crazy Otto's on Avenue I for breakfast and let us do the work! Our deputies will act as your server and bus boy/girl! All the tips we receive will support the Special Olympics! 100% of the proceeds for both events stay LOCAL, going to our amazing Antelope Valley athletes and assisting them in funding their dreams come true! Bring your family, friends, teachers and neighbors for a donut on Friday, then a huge, delicious breakfast on Saturday and support a great cause!